Technical * Minimum Weight: 780g * Packed Weight: 887g Product Description Redesigned for 2014! The Gear Shed doubles the storage space of any Hubba or Hubba Hubba tent with an additional 26 sq. ft. (2.5 sq. m) of covered storage, giving you the versatility to make one tent do it all. Added Storage: Hooped vestibule doubles weatherproof storage by adding 2.5 sq. m of covered storage. Integrated Floor: Partial floor creates a clean place to store gear out of the way. Versatile: Adapt your backpacking tent into your park and play basecamp tent or add space for extended backcountry stays. Convenient: Extra-large door and integrated design allows convenient, covered access to your gear. 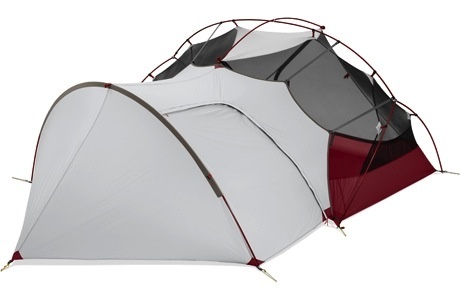 Compatibility: Works with all existing Hubba, and Hubba Hubba tents including NX and HP versions. Not compatible with Mutha Hubba tents or Papa Hubba™ NX tent.